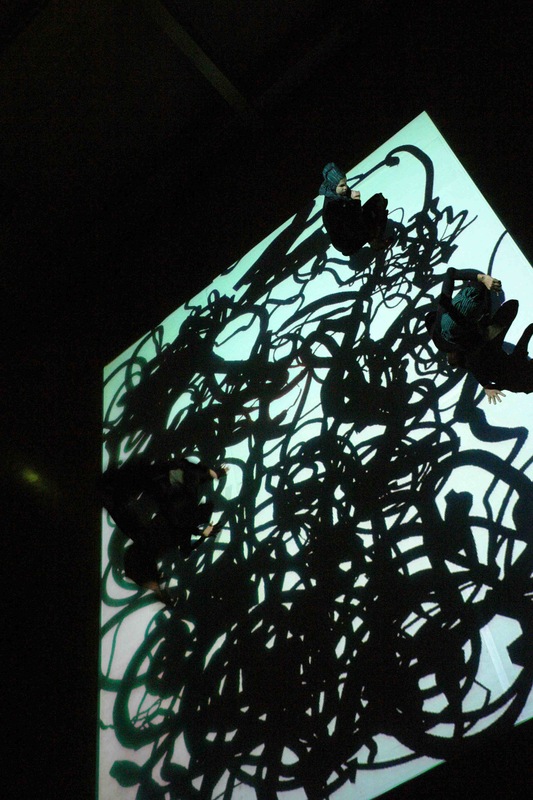 A month Platform including: a performance, workshops, exhibition, a collective installation and lectures. An exchange of knowledge, creativity and proposals on how to appropriate the highly regulated and changing public spaces in the city of Copenhagen, through small art interventions, and how to think of possible cartography of actions, in relation to the trinity of Territoriality, Power and Identity, inviting Danish artists and citizens living in the periphery. Since the city of Copenhagen has been going through a fast transformation of its urban space and use, the performance was created under the premises Copenhagen has turned into a Mausoleum. The physical bodies navigate through the slow passages of a dying city, and through the birth of a new space, which appear as a dystopian. 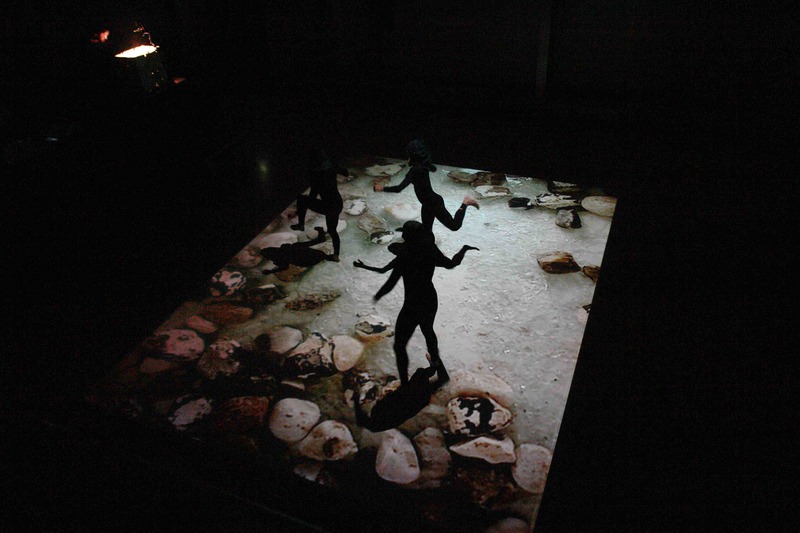 The performance investigates how to work with digital media technology as analog, responding to the concepts of work as supposed to the aesthetic in which digital media tends to over rule. A trilogy exploration of territory, power and identity. 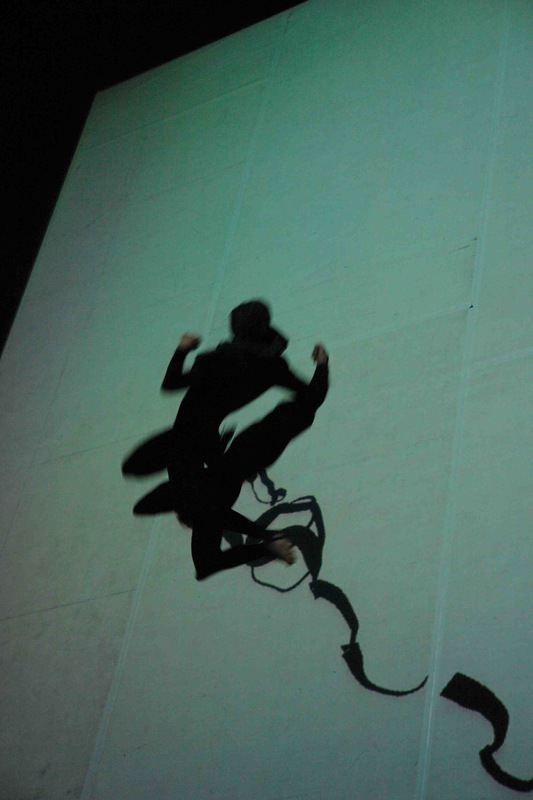 A collaboration between: Joen Vedel (visual art), Esther Wrobel (performer/choreographer), Martin Vognsen (composer/musician), Casper Øbro (Graphic designer), Ylva Henrikson (performer/choreographer), Sara Gebran (performer/choreographer). A creative and reflective project about the perception and use of Copenhagen and of dreams of change. 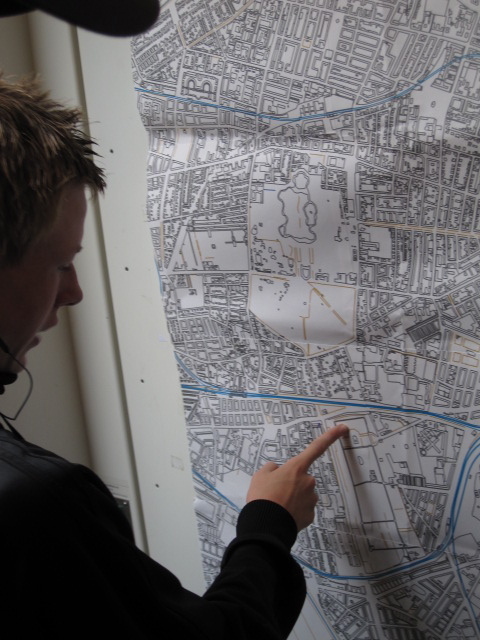 Map and share your personal view on the city. Building physical models and ideas for new ways of inhabiting and using the space we share, in collaboration with art and architect students and local citizens of Copenhagen. A 3 days workshop. The results of the workshop will be exhibited. Look below. Dates: 29.-31. juli/17.30 – 21.00. youth from 14 til 25 år. At Vesterbro Ungdomsgård, Absalonsgade 8, 1658 København V.
5.-7. august/17.00 – 21.00. Nørrebro Bibliotek, Bragesgade 8b, København N. Alle er velkomne. Relax in your city. 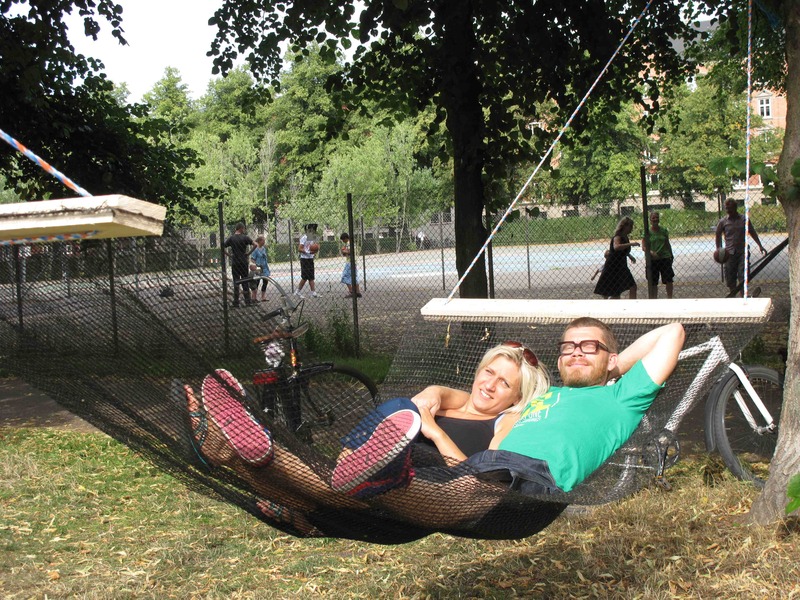 Learn how to make hammocks and hang them up in the city with us. Date: 1 August/14.00. Enghave Plads, Vesterbro. Date: 9 August/14.00. Nørrebroparken, Kbh N.
A playful social meeting. 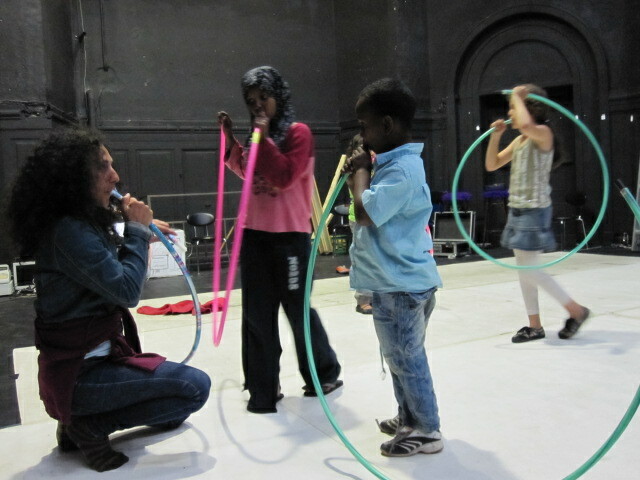 Have fun learning new ways of using the Hula Hoop ring with others. A tool for communication. Break down your borders. 31 July/16.00 – 17.30. Vesterbro Ungdomsgård, Absalonsgade 8, 1658 Kbh V. 1 August/10.00-11.00. Gårdhaven i Toves Galleri, Vesterbrogade 97, Kbh V. 5.& 7 August/16.00 – 17.00 + Nørrebro Library - Bragesgade 8b, Kbh N 8 August/12.00 – 13.00. 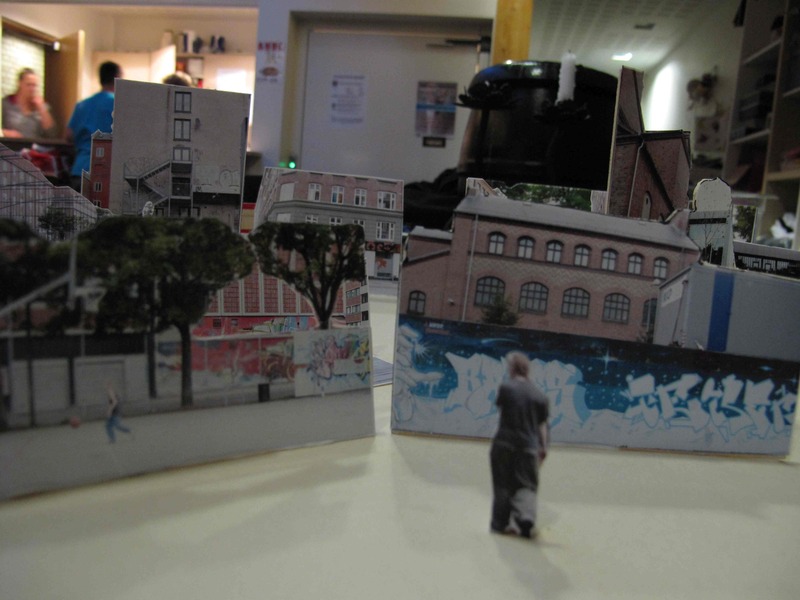 Nørrebro Library - Bragesgade 8b, Kbh N.
Your part of our city - Installation from the workshop in Vesterbro Ungdomsgård. Dates: 1.- 4. august. At Løve’s Bogcafé i Toves Galleri, Vesterbrogade 97, Kbh V. Date: 8.–29. August. 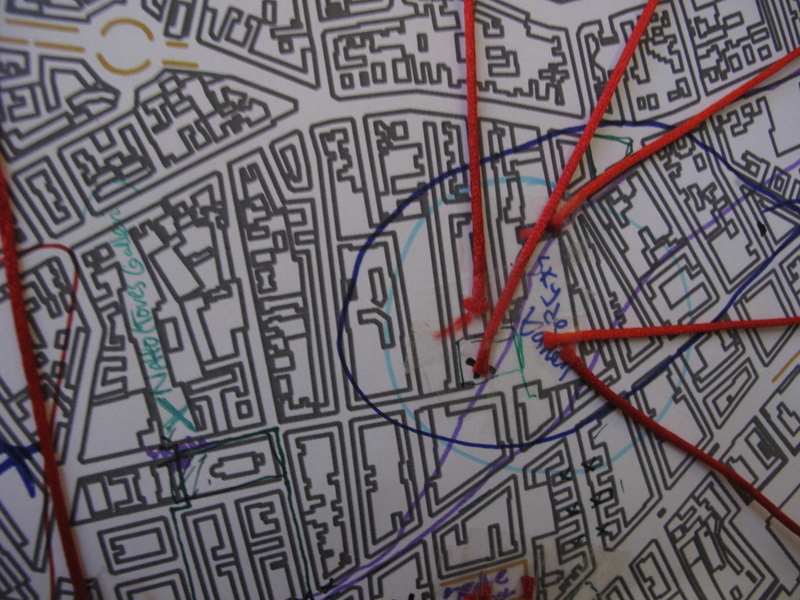 At Nørrebro Bibliotek – Bragesgade 8b, København N.
Video & photo documentation of ‘Vertical Exile - West Bank’ of the refugee camps Jalazoun and Deheisha, April 2009. Dates: 1.-4. August. At Løve’s Bogcafé, Toves Galleri, Vesterbrogade 97, Kbh V. Dates: 3.-29. August. 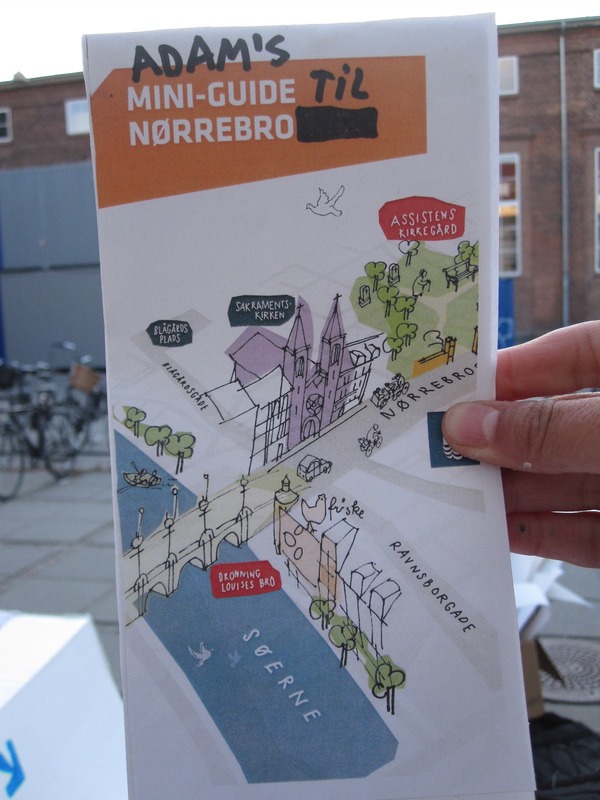 At Nørrebro Library – Bragesgade 8b, København N.
The city’s invisible dimension - mapping of the metaphysical layer of Copenhagen through the history of the churches. Lecture by topologists Sylvester Roepstorff. 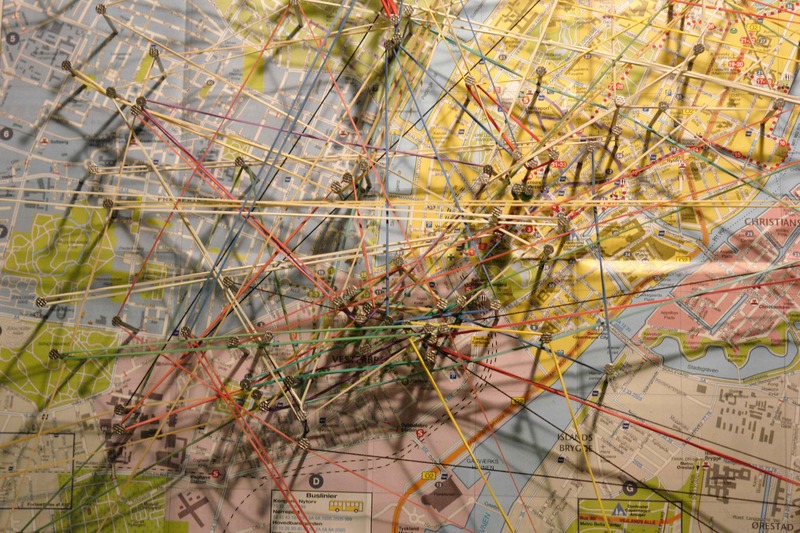 ‘Inspiration for visual mapping of the city’: How do you see the city with the body and the eye, and how do you categorize things and visualize them in drawings. 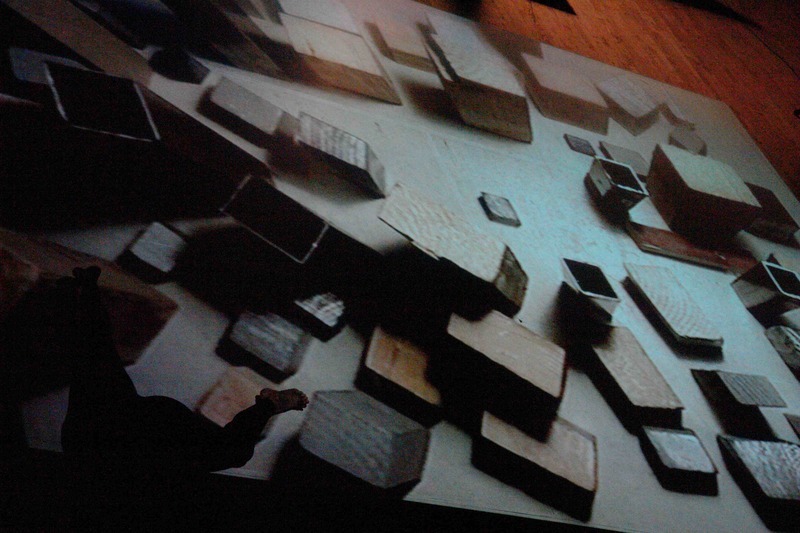 Lecture by artist and architect Biba Fibiger. Date: 11. August/18.00. 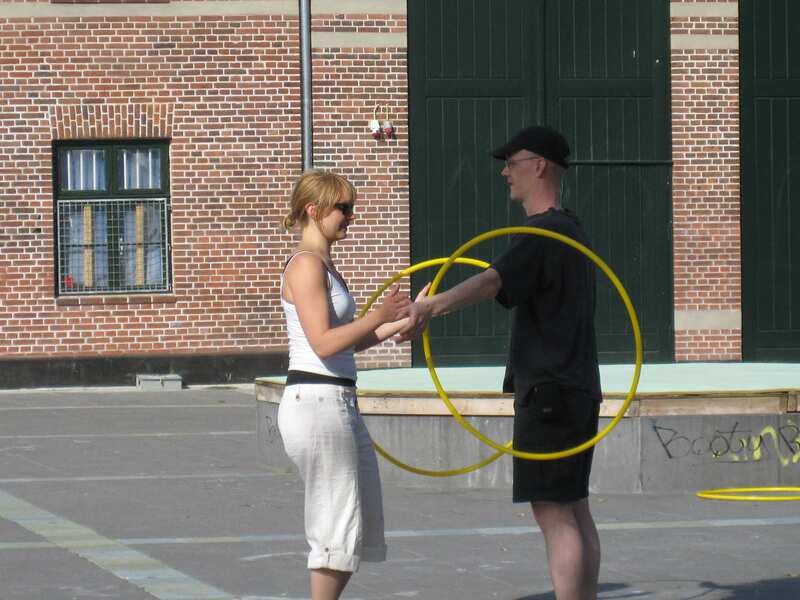 Nørrebro Library, Bragesgade 8, Kbh N.
Exchange an object for a ticket to the performance and be part of the creation of an installation in the city. 15 August/14.00. Meeting place: Bicycle bridge between Islands Brygge and Fisketorvet. CREDIT: WORKSHOPS & INSTALLATION: Celine Bardram, Joen Vedel, Mikael Bing, Allan Myrup, Thomas Bo Østergaard Sylvester Roepstorff, Biba Fibiger, Emma-Cecilia Ajanki, Sara Gebran, Ylva Henrikson, Esther Wrobel, Rikke Kjær, Roberta Blasone, Line Koch Nørreklit, Julia, Giertz, Nuria Pellitero. Producer: Ulrika Pii Zeuthen. Assistenter: Emma-Cecilia Ajanki, Celine Bardram. SUPPORTED BY: Scenekunstudvalg (Art Council), Copenhagen International Theater, Nordic Culture Point, Wilhelm Hansen Fonden & Danmarks Nationalbanks Jubilæumsfond. Produced by Public Eye. Collaborators: Nørrebro library, Ungdomshus in Vesterbrø and Copenhagen International Theater.